Neptune's Watch by Ronald G. Munro is an enthralling thriller with a very complex protagonist and it will have great appeal to fans of sleuth/detective novels with strong female characters. Detective Cynthia “Syd” Brogan suffered a traumatic injury a year ago, and she has barely recovered from the trauma, occasionally having flashes of the gruesome experience. The good news is that she has been cleared for duty. An investigation into the death of a vagrant leads her to the shady “emperor of the homeless” and clues to a terrible crime, but no one believes her. The threat escalates and Syd knows the danger is far worse than imagined and that the peaceful community of Virginia Beach is about to be shaken to its very roots. Now on modified duty and pending psychological review, Syd risks everything to uncover the truth, but for how long can she survive? Ronald G. Munro has the gift of storytelling and knows how to get the attention of readers and keep them turning the pages. I love books with strong and memorable characters and this author has created one such character in Detective Cynthia “Syd” Brogan. The protagonist got my attention immediately because she is genuinely flawed, a woman haunted by a painful experience. But she has an unusual sense of courage, which drives her to near impulsiveness. At every moment I thought something awful could happen to her, and it is this feeling that the author ignites in readers, reinforcing it with the skillful use of suspense. Neptune's Watch is well plotted; a thriller that offers huge entertainment to readers. 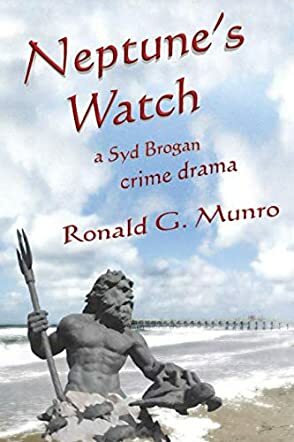 Neptune’s Watch is a work of crime, mystery and thrilling drama penned by author Ronald G. Munro. Our central detective on the case is Cynthia ‘Syd’ Brogan, returning to duty after an injury which still haunts her every time she closes her eyes. Trying to shake off her trauma, Syd throws herself into a new case at the seaside of Virginia Beach, where vagrants are dying and nobody seems to care. When Syd uncovers a homeless ‘emperor’, the threats keep on rolling out until the town and the entire coastline might be in danger. With nobody on her side and her mental health being questioned, Syd must push past all barriers to solve this mystery. Written with the classic grace of the cosy mystery genre, plus a little noir thrown in for good measure, the work of author Ronald G. Munro is sure to please regular readers of detective fiction. I really enjoyed Syd as a central character; flawed but strong, bright but also liable to threats of flashbacks and genuine trauma from her time in the field. Despite the bizarre events that sometimes happen in the plot, Syd’s sense of realism really grounded the tale and allowed us to go on that wild ride with her until we could uncover the truth of it all. The short chapter structure really lends itself to uncovering different people, places, and slices of the mystery for high readability. Overall, I would certainly recommend Neptune’s Watch as an excellent coastal mystery novel for genre fans and newcomers alike. Neptune's Watch by Ronald G. Munro is a crime thriller novel set against the backdrop of contemporary life in Virginia Beach. The novel jumps right into the plot from the very first chapter as we get acquainted with a homeless man and his lifestyle. He sometimes works for a shadowy figure in the underworld of whom we only catch glimpses. There are a number of characters we then meet in the detective and investigative squad including ones working in cyber-security. Detective Cynthia - or Syd - Brogan is a capable woman suffering from flashbacks and past trauma from previous cases. She is on the case as reports spread about a threat that could be potentially dangerous and devastating. This is just one thread of this plot that weaves intricately through various twists and unexpected surprises that shine a light on sociopaths, mental illness, police and investigative work, the criminal underworld, and much more. Neptune's Watch by Ronald G. Munro is not only a creative novel but it also manages to address some real issues in modern day society. I liked that we get more of an insight into what homelessness looks like, for example, and what a typical person living on the streets may think or feel. I also liked that sexism in society seems to have been portrayed as it tends to be in the real world, which is also an important issue that needs be highlighted. Same goes for acts of terror or anarchism. The author did a good job writing in a lucid, engaging style that keeps the narrative moving fast while also keeping it relatable. This is a book that fans of the thriller or crime genres would enjoy. Neptune’s Watch by Ronald G. Munro opens with a vivid picture of down-and-out Doaks, who suffers mentally from injuries sustained while serving with the military in Afghanistan. He is homeless from choice; he cannot bear to be confined. He lives on leftovers given him by a man who works in a food outlet, and drug-running for “The Emperor”, the King Neptune ruler of the homeless around Virginia Beach. Detective Cynthia “Syd” Brogan is disliked by her Homicide Unit boss because she is female and he thought he was rid of her after a traumatic injury. She is assigned to the case when Doaks is found dead, but was it a mugging gone wrong, as a witness claims, or natural causes, and who IS The Emperor and where does Swiftbit fit in? Detective “Syd” Brogan battles with flashbacks to an earlier incident in her career and her own impatience to get results, but is there more to the death of a vagrant then she bargained for? The press believes so – “Biblical Disease Strikes Boardwalk! City in Panic!” – and there is scientific evidence to support the idea of a water-carried plague. Were all the germ-warfare weapons destroyed after WW2? It becomes a terrorist threat, not only to the inhabitants of Virginia Beach, but the whole Eastern Seaboard, and who has sensationalized the situation? Syd. In defiance of her boss’s orders she risks her career and her life in an attempt to nullify the danger. Ronald G. Munro has researched his subject in depth and used it in Neptune’s Watch to create a riveting thriller with an alarming scenario! Neptune's Watch by Ronald G. Munro follows Detective Cynthia Brogan who gets cleared for duty after a year recovering from traumatic injury. She still suffers from the trauma. An investigation into the death of a homeless drunk leads Detective Brogan to uncover a horrible crime with far-reaching consequences. But no one seems to believe her. Instead, she is put on modified duty and is about to face psychological review. With a deadly threat heading towards the peaceful community of Virginia Beach, Brogan has to choose between her career and her conscience, but is she ready for what awaits her, even after defying orders? While this novel is a success at different levels, it was the wonderful character handling that impressed me. Detective Brogan is a broken person when readers encounter her, a character who has been through a lot. And while she refuses to allow a traumatic experience from her past to bring her down, she comes across as stubborn and as someone who trusts her gut feeling. An investigation that starts as a simple look into the death of a vagrant quickly escalates into a conflict of phenomenal proportions. The writing is beautiful, the prose crisp, filled with enticing sentences, and the author demonstrates a keen sense of economy of word in the writing. One gets the feeling that no word is wasted and that every dialogue is well thought out and beautifully written to advance the plot and to enrich the reading experience. Neptune's Watch is ingeniously plotted and skillfully written. Ronald G. Munro creates characters that are real and that readers will love to follow.